Chopsticks specialises in both Chinese and Thai dishes and has a massive local following. It’s one of just a handful of Asian restaurants in Hamilton and also has a take-out section. Pop in here in the early evening to gauge its popularity; the telephone rings constantly and a there’s a continual stream of people coming to collect their orders. The décor in the restaurant itself is distinctly oriental with painted fans, rice paper umbrellas and oriental prints. It’s divided into several sections and can accommodate up to 80 diners. Prices are reasonable and service is brisk and attentive. Unpronounceable Thai specialties include Yum Lab (your choice of meat with onion, pepper, tomato and cilantro in a spicy lime sauce). Our personal favourite is the Thai Green Curry (choose from chicken, beef, shrimp or scallops with tomatoes, bamboo shoots, mushrooms, baby corns, coconut milk and green curry paste). For dessert try the imaginative Frozen Bailey’s Mud Pie to round things off. In addition to a good selection of western beers, Chopsticks serves Tiger. This Singaporean beer is sweet and light and is a great partner for spicy Asian food. Wines are available by the glass and bottle. Chopsticks is open every day of the week. Lunch is served Monday to Friday 11.30 am to 2.30 pm. Dinner is offered daily between 5 pm and 11 pm. It’s situated at the eastern end of Reid Street in Hamilton. 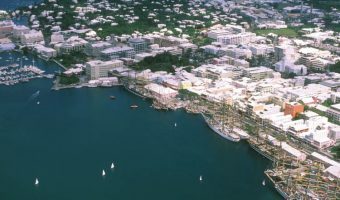 The restaurant is one of two operated by the Bermuda Restaurants group. The other is Rosa’s, a Tex-Mex restaurant on Front Street. Map showing location of Chopsticks. Good choice on the menu and some excellent vegetarian options. Foreign waitress was pleasant enough. I am chinese so believe I have a fair undersatnding of what takeaway chinese food should taste like…this restaurant is awful. Try sung sing near the police station for take out – it is not great but alot better than chopsticks. Well I’ve eaten at chopsticks around 50 times, mostly takeout. I think the food is OK. They usually get my money because they’re conveniently located ten minutes from my resting place and they’re open until 11 pm (as I work late). That’s smart business considering most take outs close at 10 around the island, with the exception of Upper Crust I believe. I ordered the sweet & sour shrimp yesterday. It was awful. They tasted like greasy chlorinated balls of sea water. Horrible! I had to throw them away and just eat the vegetables. The food is awful, fake Chinese. This is an insult to the "real" Chinese cuisine. There is no love in the food and the mushrooms are tinned. It is so disgusting I can’t say it enough!!! Please people stand up for your taste buds!!! Chopsticks is a great! The chicken Thai green curry is excellent. Chicken peanut satay appetizer is really good as well. We’ve eaten there many times, had a variety of dishes and have never been disappointed. Very reasonable prices for excellent food. Chopsticks and House of India are the top two restaurants on the island. My favourite restaurant in Bermuda. Because I work late, some weeks I take out 3-4 times. Highly recommended. I LOVE CHOPSTICKS! The food is always superb and affordable for Bermuda. No one can beat that. And for someone that is complaining about the roach. Hey, you are in Bermuda and with the kind of weather we have here you can ask around, there’s roaches in every restaurant. By the way, the staff and especially the manager is very friendly and make you feel at home. BEST TAKE OUT AND DINING IN BERMUDA! We moved to Bermuda a month ago. We ventured into Chopsticks last week and totally loved it. For Bermuda, it was really reasonable. I’m a big fan of Chinese but my wife isn’t, so she had the Thai which she also loved. I went back for a take-out at the weekend and it was equally as good, and speedy. Would recommend to anyone. It’s surely got to be better than Chinese food from a place called Upper Crust; not very traditional! Awful restaurant. Not bad for take-out, but not great either. As a sit-down restaurant it is quite disgusting. We had a roach crawling up the wall on the side of our booth, along with ants. The food was also not impressive. Bland and not overly appetizing. I will not be returning. We ate there last night and the Thai food was excellent and service was good. Great value for money for Bermuda. Chopsticks is a good restaurant and I recommend it to anyone! As for Steve M above giving it a bad rating. Maybe he needs to first realise the difference between China and Japan. L’Oriental serves Japanese food so comparing it with chopsticks is moronic. I am from Boston and, compared to even the run-of-the-mill Chinese restaurants there, Chopsticks falls short. I think calling the food "vile" is a bit strong; I would describe it as bland. I have only eaten there twice (in the two years on the island) and am not rushing to go back. The food at Chopsticks is absolutely vile. The Chinese in particular, is inedible. L’Oriental Express and Upper Crust/Indigo are infinitely superior choices for Chinese in Bermuda. I love Chinese and live in Bermuda, so I know what I speak of. I have never had a good meal here (one sit down and two take-away meals), the reason it is always empty I guess. Also heard them advertising ‘Shark Fin Soup’ the other day, so if you have a conscience then you won’t bother with it either. I eat at Chopsticks every time I am in Bermuda. I have never tried the Thai, but the Chinese is very good. I don’t understand why it is always empty. This is the best takeaway in Bermuda. Always quick and efficient.